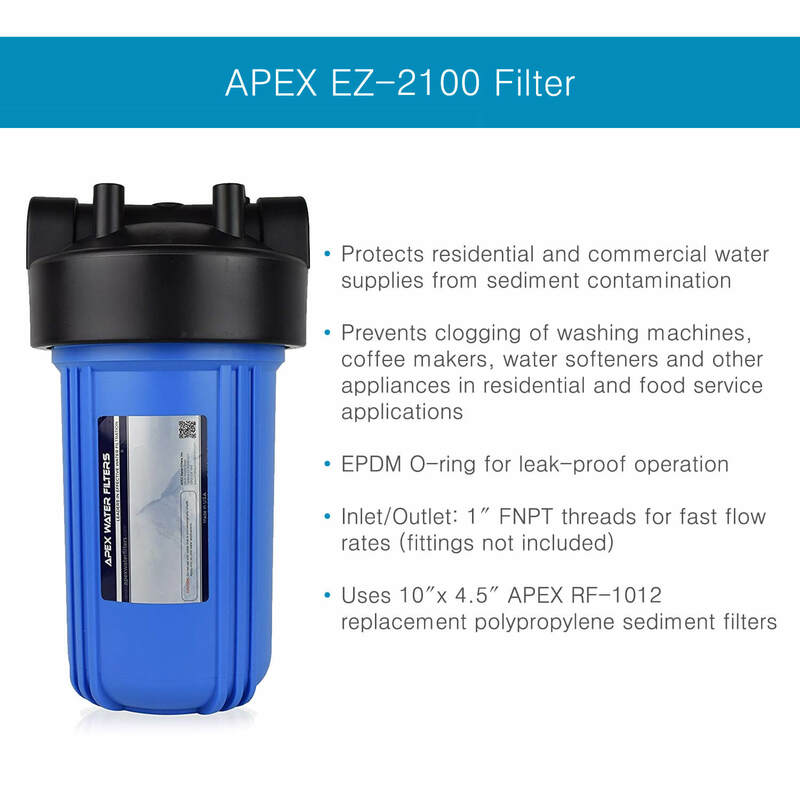 The APEX Whole Home Sediment & Turbidity Removal Water Filter With nextTM Sand Media removes solid particulate matter like iron oxide (rust) particles, sand, loose calcium scale and insect parts. 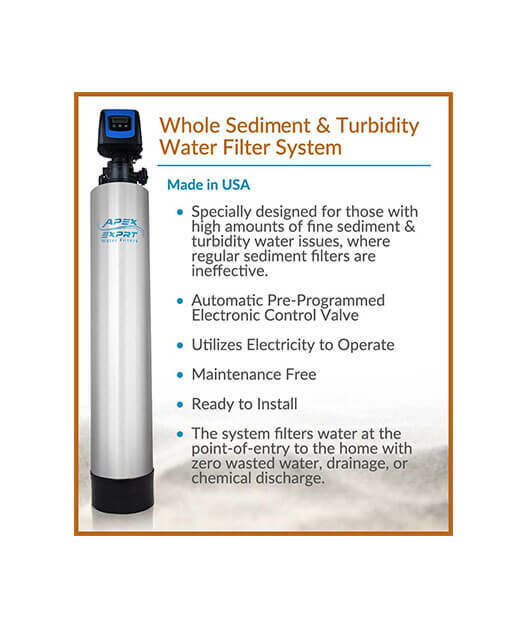 Sediment filtration protects all water-using appliances, like dish washers, washing machines, coffee makers and carpet cleaners from damage and clogging. 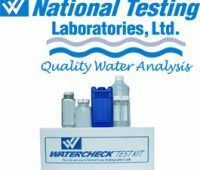 Fine particulate matter is abrasive and will prematurely wear out faucet seals, O-rings, pumps and electric valves used in dishwashers and clothes washers. 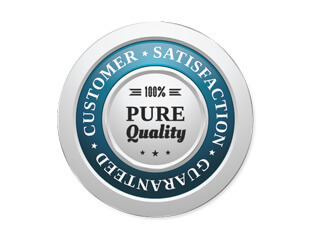 Particles of sand, grit and iron oxide quickly clog the fine screens and tubing used in home and commercial coffee makers, expresso machines, ice machines and beverage dispensers. 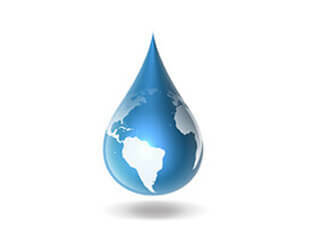 Sensitive water-using medical and dental equipment should also be protected against clogging and sediment damage. 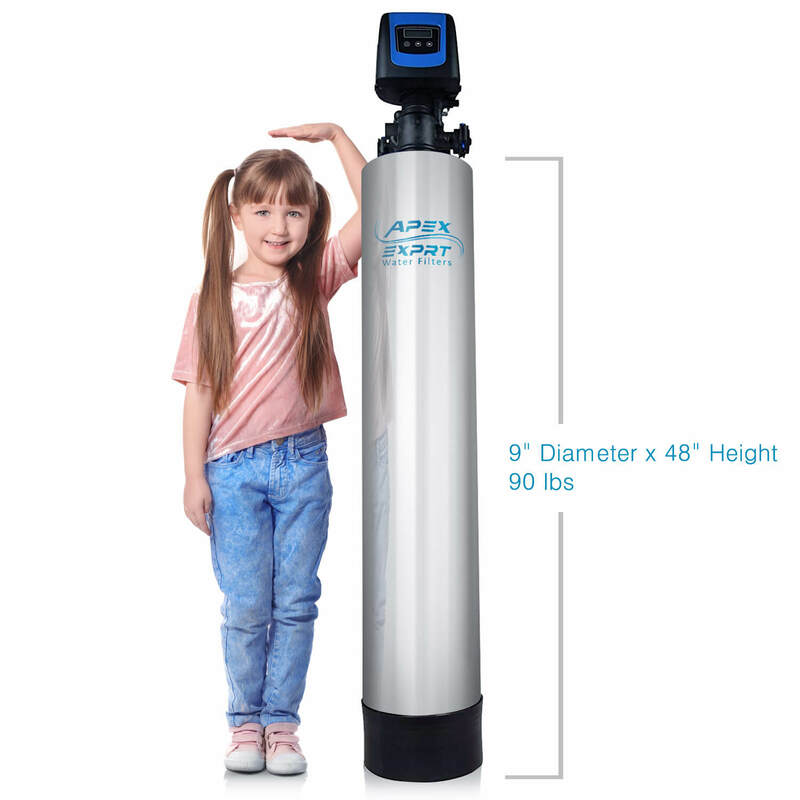 The APEX Whole Home Sediment Water Filter will also function as a high-capacity pre-filter that protects whole house and commercial reverse osmosis systems, water softeners and other APEX filtration systems. 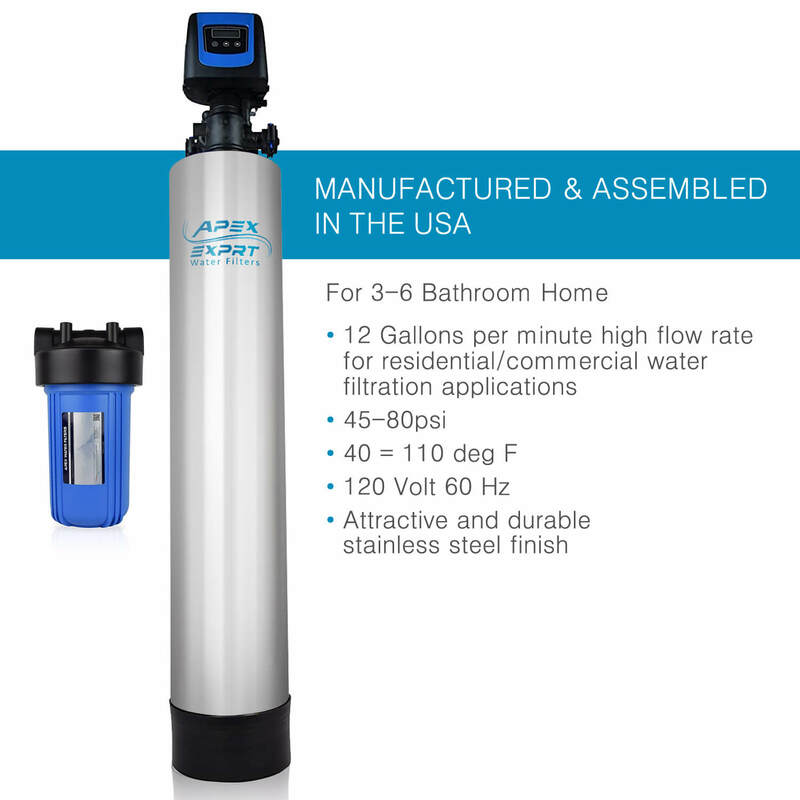 The APEX Whole Home Sediment Water Filter is designed to the highest standards and assembled in our US manufacturing facility. 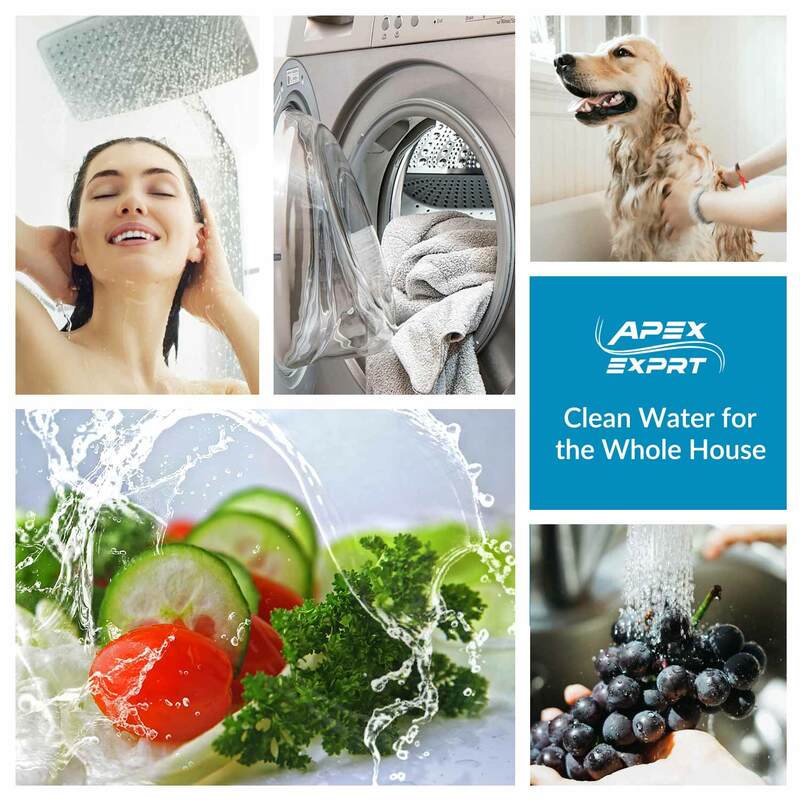 The APEX Whole Home Filter uses nextTM Sand sediment filtration media. nextTM Sand is produced from a unique mineral deposit having high surface area and porosity. The surface structure features microscopic mineral projections that allow particulate matter to penetrate deeply into the bed. It will remove tiny particles down to 5 microns in size! 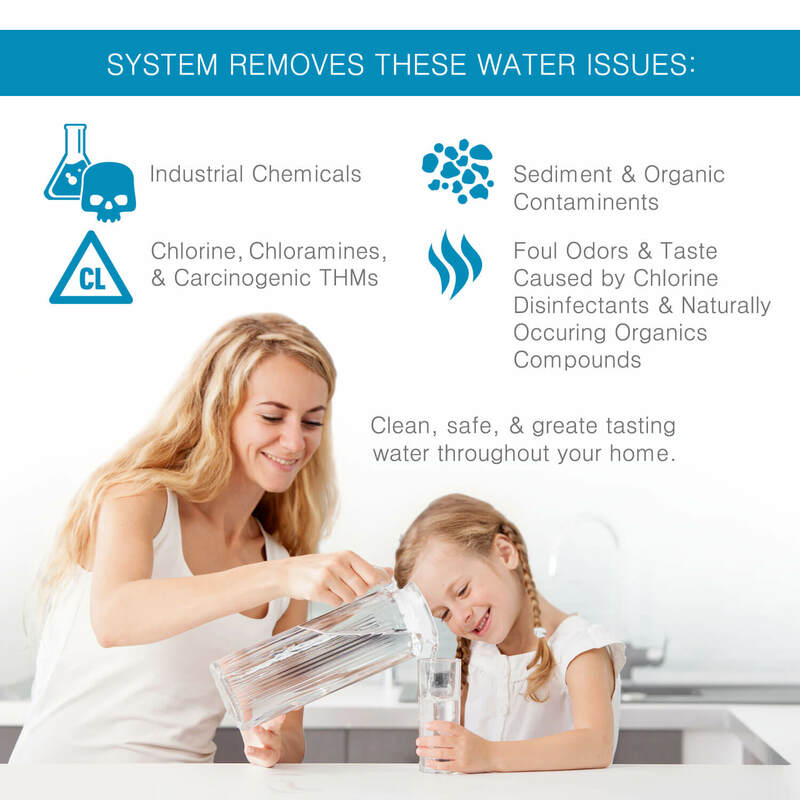 These properties make nextTM Sand an ideal sediment filtration media. 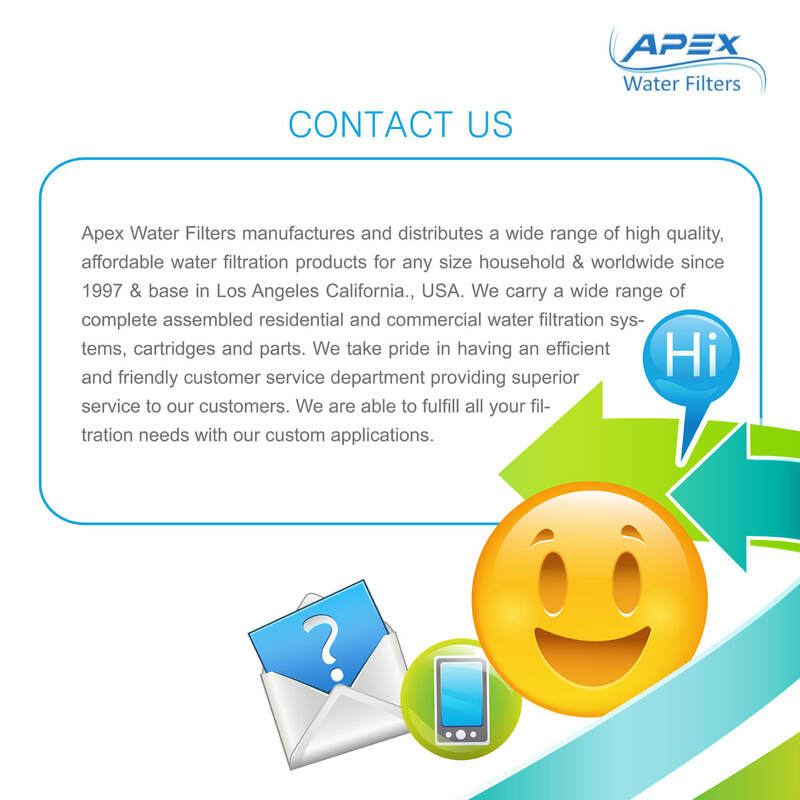 The Filter uses a large capacity media tank along with an advanced Fleck electronic control valve. 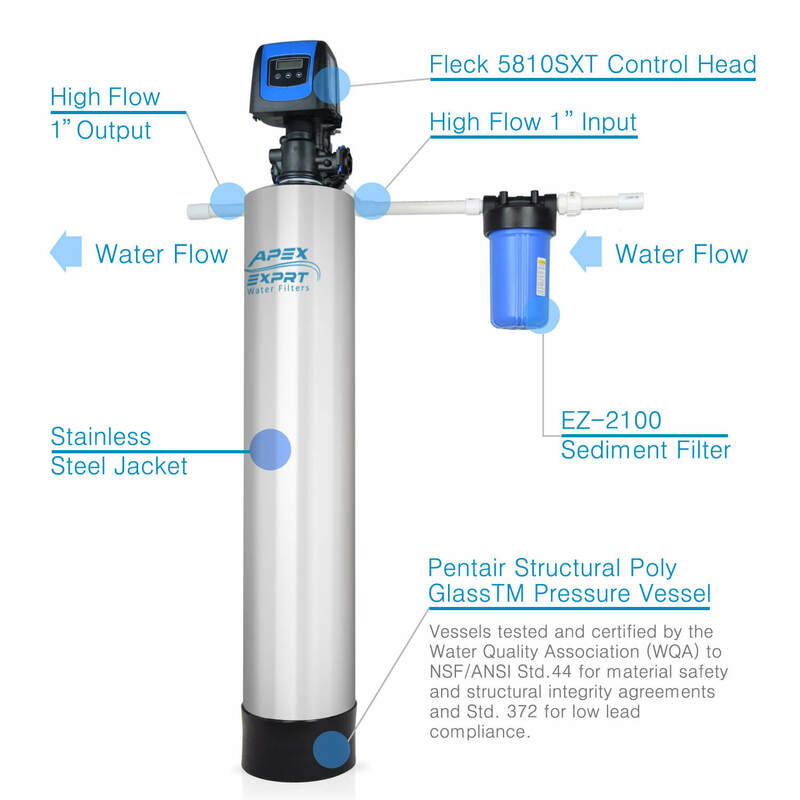 The Fleck electronic control valve monitors and regulates the backwashing of the nextTM Sand filter media. 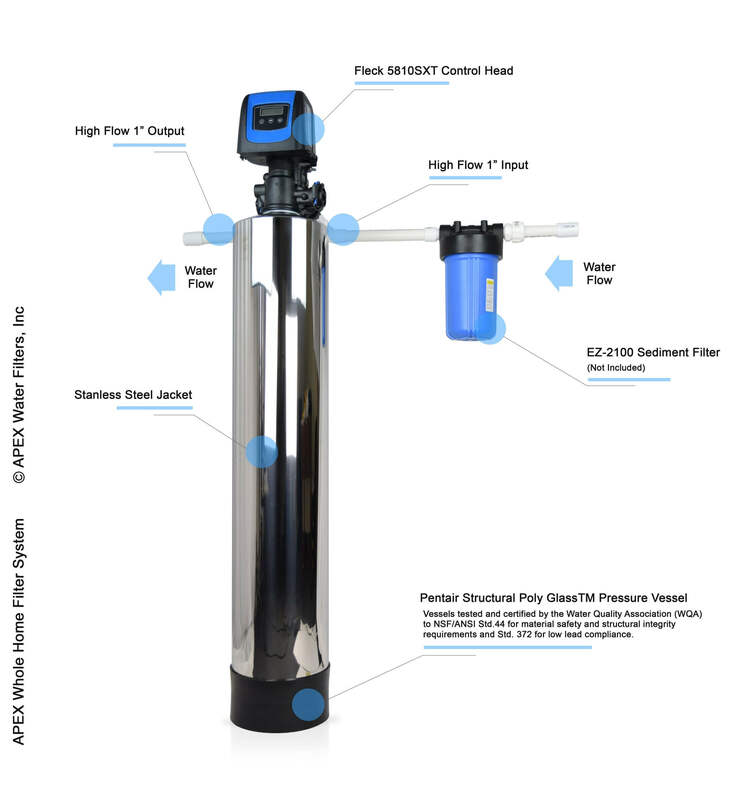 The electronic control valve automatically backwashes and cleans the filter media based on water usage. 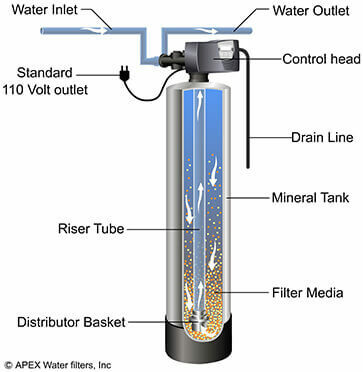 This keeps the filter system clean and working properly with no input from you. The easy to use key pads and digital display allow for a quick and easy to set up. 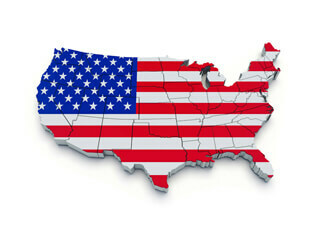 Calcium scale particles, rust, sand and other microscopic debris. 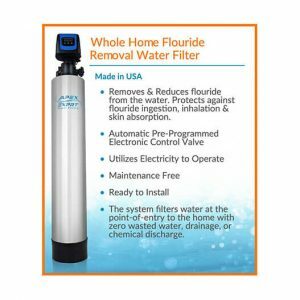 High-efficiency whole-house sediment filtration system. Removes calcium scale particles, rust, sand and other microscopic debris. Removes particles down to 5 microns. Automatic backwashing feature for trouble-free operation and long service life.